First of all we are parents, Bella (Mom) and Irek (Dad), and we are fortunate to get to be parents of Delilah. Also very fortunate to be living in Canada where the health care system is so good. The Sick Kids hospital which a lot of times is like our second home, is actually not that far from where we live. 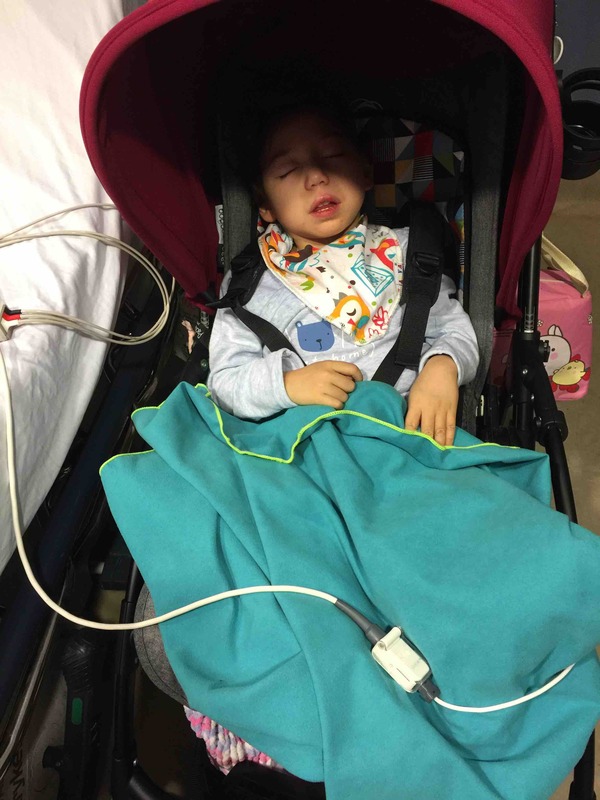 Delilah is a 2 year old super happy little girl, who has been diagnosed with Cerebral Palsy. The diagnosis was a result of Mutation of Collagen 4 Alpha 1 (COL4A1). While Cerebral Palsy is a blanket term commonly referred to as “CP” and described by loss or impairment of motor function, Cerebral Palsy is actually caused by brain damage. The brain damage is caused by brain injury or abnormal development of the brain that occurs while a child’s brain is still developing — before birth, during birth, or immediately after birth. Cerebral Palsy affects body movement, muscle control, muscle coordination, muscle tone, reflex, posture and balance. It can also impact fine motor skills, gross motor skills and oral motor functioning. COL4A1 is one of the components that build human body, the mutation of COL4A1 had caused Delilah's micro vein in her brain built smaller than it supposed to be and it was bleeding 6-8 weeks before she was born. She had stroke and bleeding in utero. The pregnancy was normal and I was pretty healthy even before I was pregnant. We don't know any of this would happened, we thought she's healthy. When she was born she had to stay in NICU for few days due to low sugar and Jaundice. At the time I thought that was hard. After we got discharged and went home for few days we found out her thyroid didn't develop properly, she has to take hormone probably for the rest of her life but that's pretty common I found out later. Then that day had come, the day that I spot Delilah had turned blue on her face. When it happened for a 3rd time I was sure we need to take her in as it didn't feel normal to us. When the diagnosis was done on her, they told us that all this had happened before she was born. It hit me hard to find out that almost half of her brain is gone. Doctors told us that it could be fatal and it could be fine, they can’t say for sure. One thing we knew for sure was that she will need help. A lot of helps to get her where she needs to be. 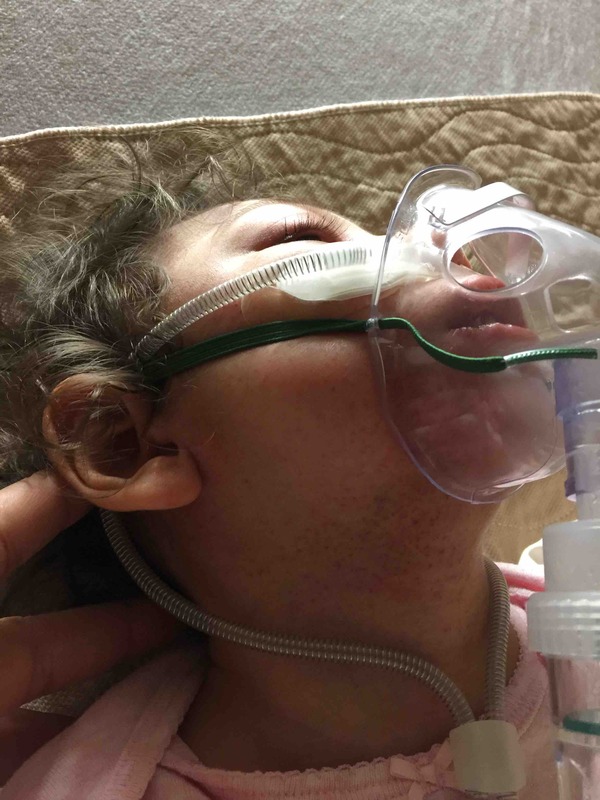 Before she turned 1, she started refusing her anti-seizure medication by mouth. 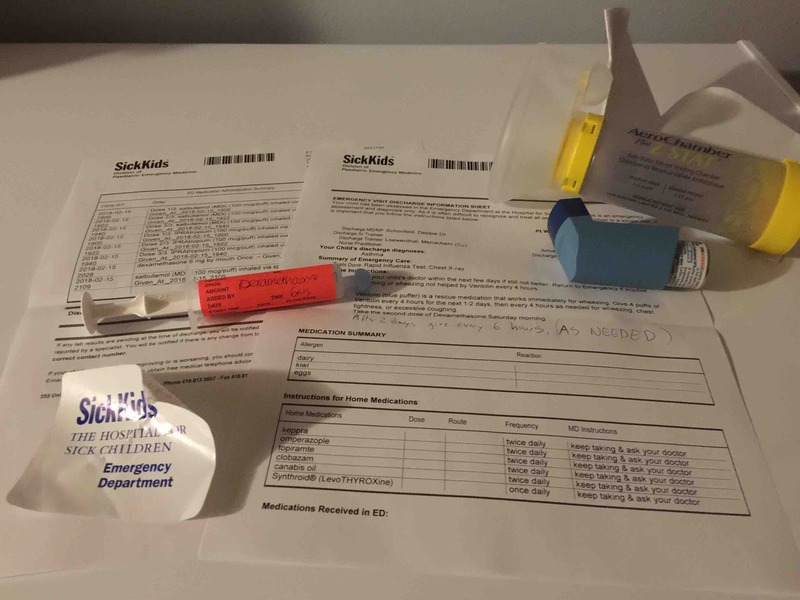 She needed to take these ACTH shots (needle injections) over 6 weeks course, this method had compromised her immune system, and when it was done she started refusing medication and also her food by mouth. 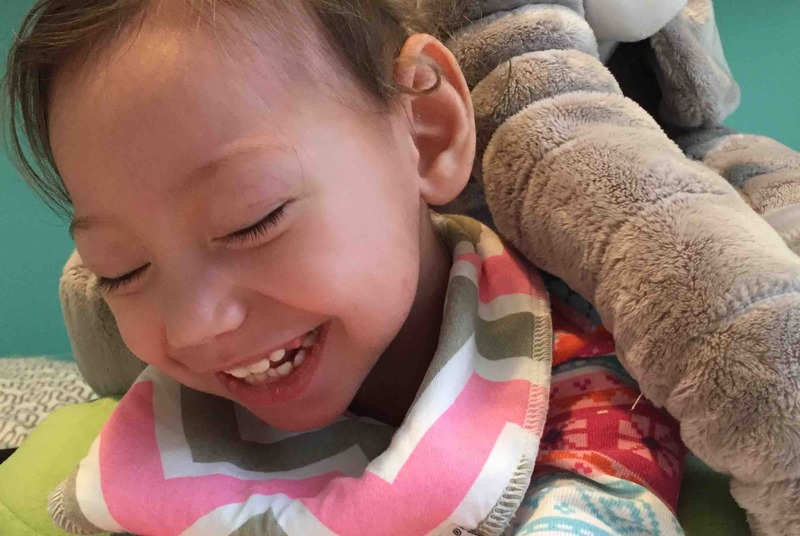 She ended up having a tube inserted that connects to her tummy to feed and give her medication directly. We then started using CBD oil to help control her seizures. 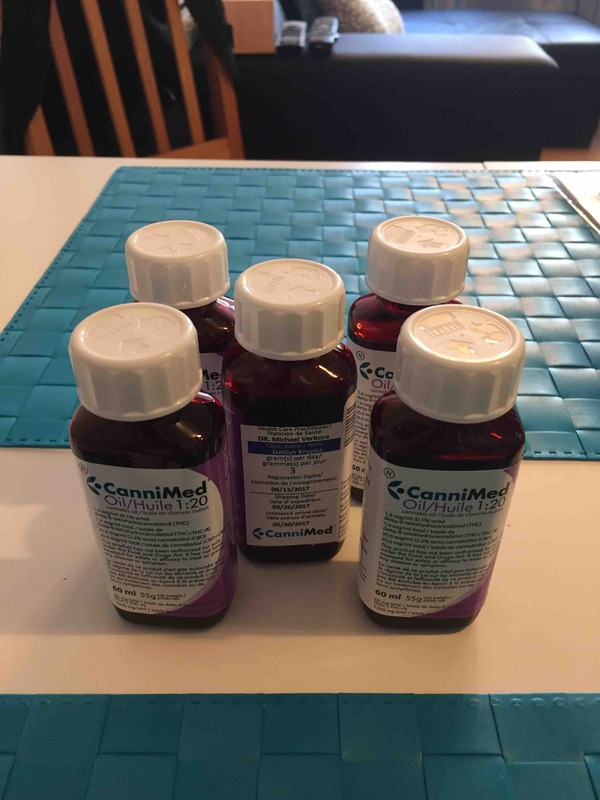 We found out about CBD from another family when we were in the hospital for almost a month (she even spent her actual 1st birthday there). CBD does help controls her seizures. However, it’s extracted from Marihuana, CBD is the medial component, and the THC is the component that makes you high. The oil we give her is a 20:1 ratio, meaning that she’s getting 20 part of CBD for every 1 part of THC. There currently is no way to just get the CBD by itself. The CBD oil and medical marihuana in general are currently not supported by any insurance company or government. That might change in the future with the legalization of Marihuana, but for the time being we are paying for it out of our own pocket, which is about $700 a month and this will grow as she will need more of it as she grows and her weight increases. We can help her with her development by doing a lot of different therapies. Since she also has CVI (which is Cortical Visual Impairment – essentially this means that her eyes can see, but her brain does not interpret what she sees). We need to teach her brains to realize she could see again. A Visual Therapist comes to visit her every couple of weeks or so, and we train her eyes. We need to help her and get her to see Physiotherapist and add private lesson for her too. She needs AFOs for her feet to help her bare her own weight. She needs stander that will help her standing, she needs walker to help her walk. 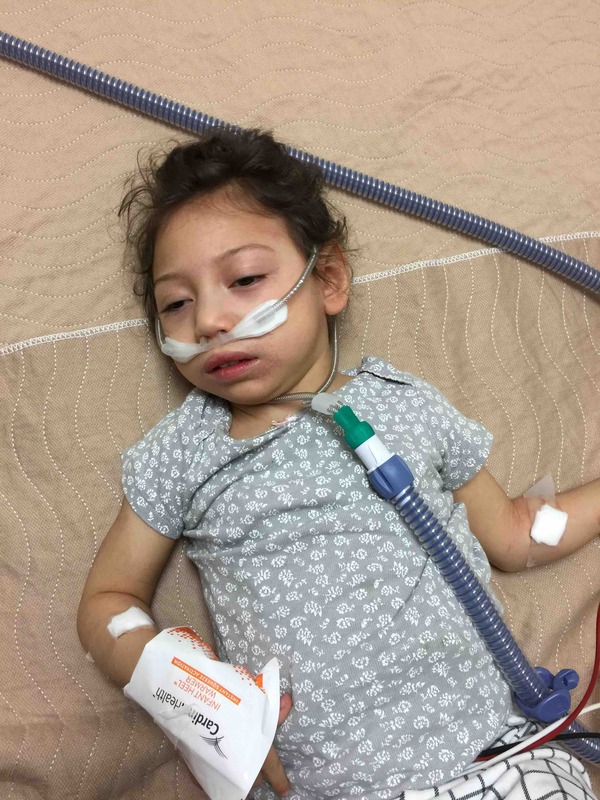 And we need help from our friends and anyone that would like to help, because we cannot make it by ourselves but we need to provide these things for Delilah so she would continue having hope to be able to take care of herself, live her life as one person can do at best, like everyone else. And thank you everyone for helping us. I will make sure she will grow up to be good person. This fund will be for Delilah medication, Physiotherapist sessions, and her devices for developmental support. Some of the specialized devices are covered by the Government of Canada and some are covered by Irek’s work insurance, but after all that, there’s still a lot of things that are not covered 100% or covered at all. Currently, on any given week Delilah has at least 3 appointments, sometimes there’s two a day, as a result we are one income family, because I take care of her full time while Irek is at work. We will keep this page going with any updates in terms of her progress in her development. Right now she’s just over 2 years (born on April 8 2015), and she does not say any words, does not look at anyone, does not focus her eyes on anything, she does not sit or roll over. However her neck control is so much better than what it used to be when she was 1 or so. We can hold her by her waist and she could keep her body up and her head up (if she wants to, she doesn’t always want to). But that’s great progress. We are very hopeful for the future, we have small milestones that we look forward to, for example we hope that she could walk by the time she’s 4, even if it’s with help of some devices, like crutches or whatever it is. And we hope that she will be independent at some point in her life. Thanks again for your support from the bottom of our hearts. Delilah got sick with a fever. We ended up at sick kids hospital because she was having trouble breathing. They gave her rescue medication and it helped. We took home Ventinal (puffer) and the adapter mask for her. She was ok after two days. She fell asleep after all her meds. Take home Ventinal” and adaptor mask. 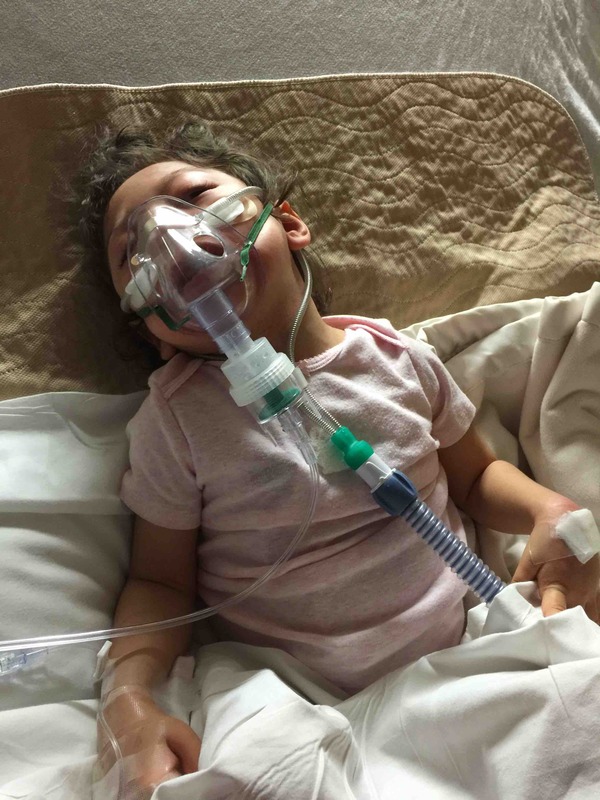 A month after Delilah got sick and was at sick kids hospital, she gets sick again and again has trouble breathing. This time it’s more severe. We are here for the 3rd day. We share a bed next to hers. Today Delilah is 2 years and 4 months. 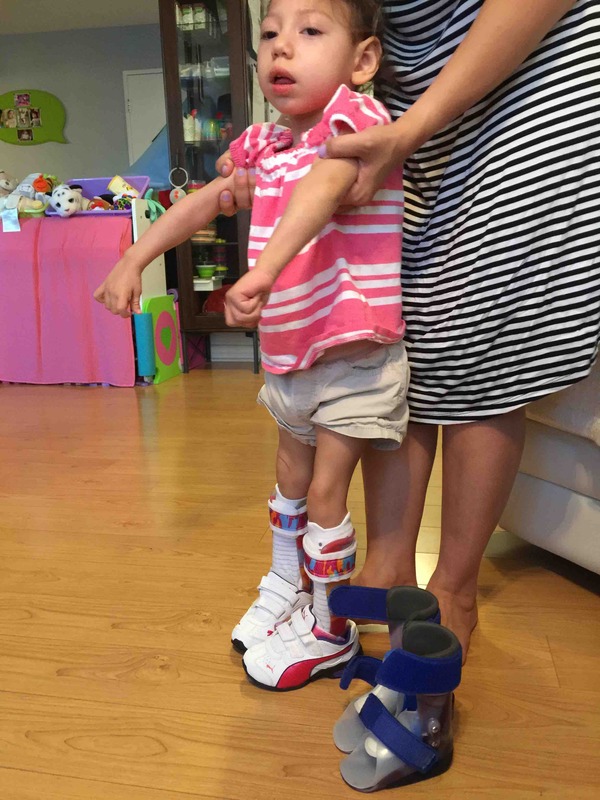 She got her new AFOs (Ankle Foot Orthotics), they are bigger to keep up with her growth. They are nice colourful one piece, the old ones were gray and blue and a two piece. 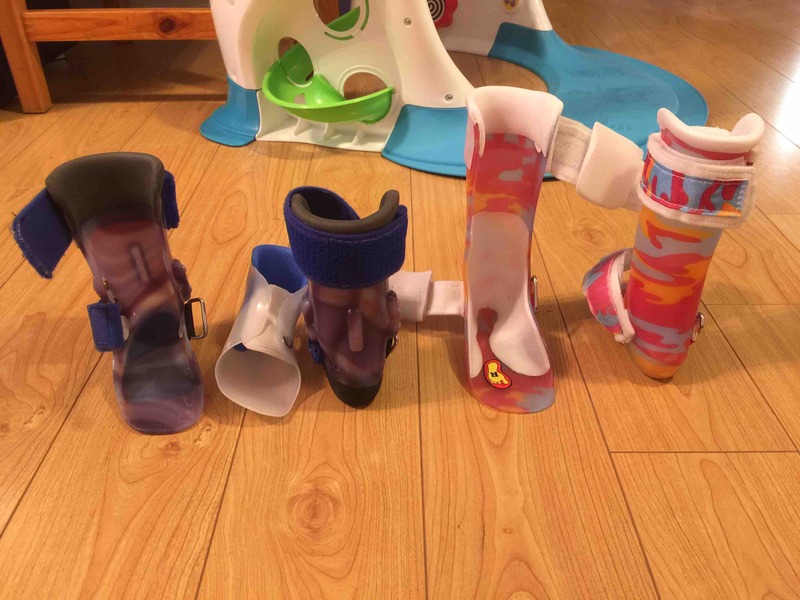 It took much more time to put on the old ones because when she didn't want to wear them, it was quite the battle to get them on her feet. Now it seems to be going much better. Old ones on Left, new ones on Right.